F/Lt Edward (Scobie) Dalrymple, 1918-1996 Dominica. A distinguished journalist/historian Scobie was born in Dominica, a British colony. As a working journalist in London, Scobie became a correspondent for the Chicago Defender and for Ebony and Jet magazines. He enlisted to serve the British cause during World War II, serving in the Royal Air Force as a pilot officer. After the war, he contributed to many London newspapers, magazines and the wire services, and became a frequent broadcaster and scriptwriter for radio and television. From 1961 to 1963 he edited Flamingo, a monthly magazine published in London for African people in Britain, Africa and the Caribbean. Scobie was twice the Mayor of Roseau, capital of Dominica, and vice-president of the Dominica Freedom Party. Edward Scobie was Professor Emeritus of History, Black Studies Department, City College of New York. Previously, Dr. Scobie taught at Princeton and Rutgers Universities. He authored Black Brittania and The Global African Experience. I have met Ed Scobie and know him personally as a great fellow Dominican who made a great contribution to the political and social development of Dominica. His contribution also included the field of journalism. His career as a Flight Lieutenant in the Royal air Force should be recognised. I knew Edward Scobie as a boy on Dominica when he was editor of the Dominica Herald. He later became a professor of African History at Princeton, Rutgers and City University of New York. In 1968 he co-founded the Dominica Freedom Party whose leader Dame Eugenia Charles later became the first female Prime Minister in Caribbean history. He authored Black Britannia and changed his last name from Dalrymple to “Scobie” after World War II. 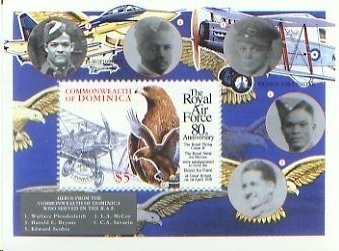 There exist a Dominica postage stamp which features Scobie and several other Dominicans who served in the Royal Air Force during World War II. About a dozen Dominicans served in the Royal Air Force, some like Clifford Severin having first trained as aircrew in Canada. We have found the actual grave sites of two were KIA; Sgt Osmunde St. Clair Alleyne and Harold Cherberd Bryant, DFC. For purposes of your website being more detailed I offer the photos of Dominican RAF aircrew member Clifford Severin, who came through the Royal Canadian Air Force program. I also have interviewed the famous Squadron Leader Phillip Louis Ulric Cross, DFC, DSO (Trinidad) who featured in Ken Follets novel and Flt. Lieutenant Dudley Thompspon (Jamaica). I have copies of photos from their war service which may be added to your site. Both men are 91 and went on to distinguish themselves in law, diplomacy and public service after the war, as did several other RAF and Royal Canadian Air Force WW II veterans who became Caribbean heads of state (Errol Barrow, Prime Minister of Barbados, Milton Cato Premier of St. Vincent and Michael Manley, Prime Minister of Jamaica). 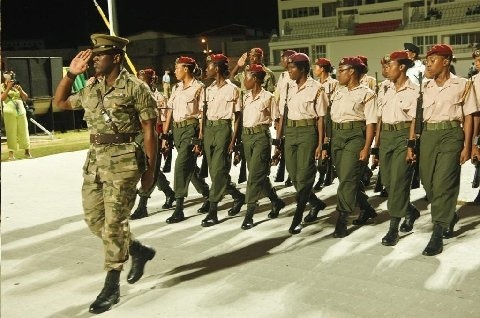 You have done service in memorializing these heroes whose service and leadership made for a better Caribbean after the war. I am currently working on a Family Tree for SCOBIE, and Edward Scobie is one of the descendants. He actually has a Scobie forbear, and would have known some of his family history hence the choice of name. I would like to contact any of the Scobie or Dalrymple descendants connected to Dominica, WI and or Trinidad &Tobago, WI. I recently read an article in a Trinidad & Tobago Newspaper which reported that Gabriel Christian is writing a book about Justice Ulric Cross. I know Justice Cross, and he did mention that he knew Edward Scobie during their sojourn in England. I am fortunate to have met Edward Scobie during his later years in New York. Edward Scobie is my late uncle. His sister, Dorothy “Cissie” Dalrymple is my late mother. Thier brother, Maurice, is the last living brother who now resides in New York City. I am proud to see my uncle’s history so honorably displayed. Years ago and worked in a hospital in Cardiff. There are two of us left of the family my brother Edward Arthur Pemberton Nad myself. 1980s and stayed with Ashton. I was looking up to try to find my grandmother but don’t know her name. She had died so we never met her. My father was Edward Arthur Pemberton, your grandmothers sister. My name is Edith Pemberton and I am on Facebook. Hello, My name is Kadija and I’m a very interested researcher on Black British publishers. I’m very interested to talk to anyone – friend or family member who knew Mr Edward Scobie, particularly about his contributions as and achievements as a journalist. I’m on twitter @kadijattug or my fb page is sablelitmag (but twitter is better!) thank you- looking forward to hearing from friends and fam of Mr Scobie!